Then you might just complete the hardest workout program ever put on DVD. Your personal trainer Shaun T will push you past your limits with 10 workout discs packed with plyometric drills on top of nonstop intervals of strength, power, resistance, and ab and core training moves. No equipment or weights needed. Just the will to get the hardest body you’ve ever had. The secret to these mind-blowing results: MAX Interval Training. Shaun T took traditional interval training and flipped it on its head—you perform long bursts of maximum-intensity exercises with short periods of rest. Each workout keeps you constantly challenged as you alternate between aerobic and anaerobic intervals performed at your MAX. The result: burn up to 1,000 calories in an hour and get the most insane body in 60 days. Elite Nutrition Plan – designed to fuel your body for these intense workouts. Fitness Guide – short and to the point. It’s just the information you need. We want you working out—not reading. 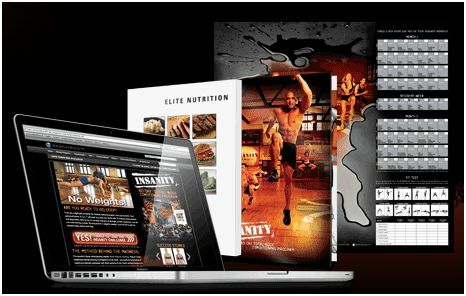 INSANITY Calendar – organized into month 1 and month 2 to track your progress, set workout goals, and keep you motivated. Plus, the Fit Test Tracker tracks your results as you watch your body transform before your eyes. FREE Online Support Tools – stay motivated with round-the-clock access to fitness experts and peer support. You have a full 30 days to try INSANITY for yourself. If you’re not completely satisfied for any reason, simply call Customer Service to return it within 30 days for a FULL refund of the purchase price, less s&h—no questions asked. If you’re up for the challenge, click below now! If you think Insanity might be too much for you right now? Try P90X first and then move on to Insanity. 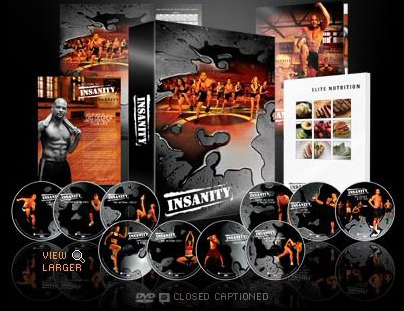 INSANITY is an extreme and physically demanding workout. This is NOT for beginners or individuals with any medical condition that may be compromised by extreme cardio and strength exercise. Consult your physician and read the enclosed materials before beginning the program.